Disinfect the sink and toilet area at weekly. Weekly bathroom cleaning is essential because microscopic life thrives (shudder) here. Even your toothbrush isn't safe from cold viruses, rotavirus, salmonella, Escherichia coli bacteria, and mold and mildew. Here's how to get rid of the pathogens and allergens that flourish here with a weekly bathroom cleaning routine in 7 easy steps. For a clean bathroom, make it a weekly house cleaning priority to disinfect the toilet, sink, and faucet handle surfaces using a disinfectant cleaner, such as diluted bleach and water. 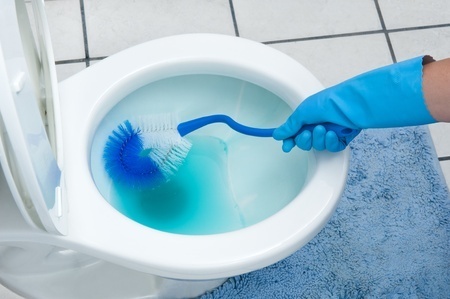 Bathroom cleaning products are tailor made for the dirty jobs here. Apply your favorite bathroom cleaner and, after 10 minutes, wipe surfaces clean with a paper towel or lint-free cloth. I prefer paper towels so that I can toss the germs - and the dirt - when I'm done without worrying about cross contamination of surfaces. You can either soak soap dishes in hot water in the sink with a squirt of hand-dishwashing liquid, or scrub them clean under hot running water with a scrubber sponge. Which ever way you go, be sure all soap scum goes down the drain before the soap dishes go back to their usual places. Wet towels and washcloths are a fertile growing ground for mold and mildew. Head these nasty things off by keeping towels and washcloths clean and dry. Closing the lid of the toilet before you flush helps to prevent stirred-up germs from the toilet bowl escaping into the air and settling on surfaces. (Ick.) Add this easy task to your housekeeping routine if you haven't already. This helps prevent germs and mold from getting a toehold. And means less deep cleaning ahead for you. Using a toothbrush cover helps to prevent airborne germs, yeast, and molds from colonizing on the toothbrush bristles, and then gaining easy entry into your mouth. Finally, remember that this room needs to be hygienic, because of kids and in spite of them. So let the little dirt devils help with these bathroom chores for kids by age.